The cold, gently breeze danced across my face for most of the night as the moon light beat into my eyes. I should have known better than to not bring a tent, but I never mind sleeping under the stars. I pulled the hood of my down jacket over my eyes and pulled the edges of my sleeping bag closer to my body. Sleep was a vague memory by the time I figured out the morning light was no longer the full moon, casting a shadow of the juniper trees over my eyes. As the morning quickly began to break I realized this was the only time I would have alone that day. The rest of my time would be filled with navigating trails, and as it turns out, pulling an armada of cactus spikes from my right knee. I hurried and unzipped the bottom of my sleeping bag, shoving my feet into my green and black approach shoes. As I stood up remnants of the previous nights poor decisions tumbled around in my stomach. I bee-lined it for my Nuun tablets and a water bottle. As two tablets of lemonade Nuun dissolved in my water bottle I parked myself on the bench of the picnic table, facing east to watch the sunrise. I came to the desert for this moment. To watch the sky change from shades of dark blue to azure, briefly settling on cyan with hints of coral pink against the white clouds before the sky burst with light. In the city I can watch the sun rise, but the sound is different. The sounds of nature are muted by the low growls of moving vehicles and a high pitched laughs of children walking to the elementary school across the street. I came here because I wanted to remember what mother nature sounds like when she wakes in the morning, and what it feels like to be pushed awake by her gentle force. 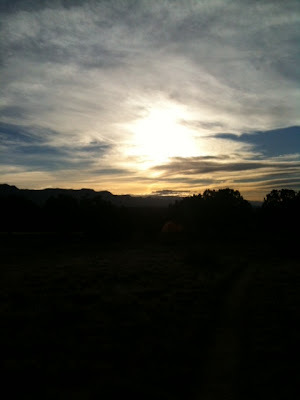 As the sun began to rise higher in the sky my ride mates shook themselves free of their tents and hammocks, dressing in their ride clothes before we took to the trails before breakfast. The stillness of the morning broken by the sound of Chris King hubs and the whirling of our drivetrains.